In programs that consider the overall earth pressure in the analysis (Earth Pressures, Sheeting Design, Sheeting Check) the partial factors are used to multiply individual components of pressure acting on a structure. The basic assumption of the analysis is that the active earth pressure acts unfavorably whereas the passive earth pressure is considered as favorable. Individual pressure diagrams are therefore multiplied by the corresponding partial factor. 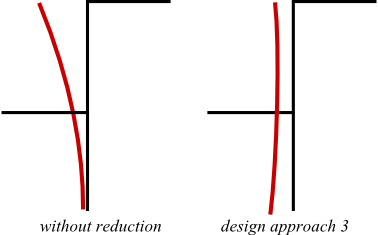 Reduction of resistance (DA2): is considered. Partial factor on resistance reduce the passive earth pressure in front of structure. In simple words, DA1 - Combination 2, DA2 and DA3 increase the magnitude of active pressure and reduce the magnitude of passive pressure, while DA1 - combination 1 only increases the magnitude of active pressure. This approach may therefore change in some cases the structure behavior and deliver misleading results. Caution must therefore be exercised when reducing input parameters.